When I took over at 5am it was light. The sun rose invisibly behind grey clouds and suddenly spilt gold over their edge. Motored on without enough wind to sail, taking evading action from large coasters and tankers crossing the North Sea. At 7am when I went off watch I made porridge in fairly tricky conditions. First hot food since Harwich. Continued motoring like this, now in bright sun until 11am when a fine welcome sailing wind sprang up. ..10 to 15 knots on the beam. Jib out. Engine off. The trouble was that as we neared the Dutch coast the swell got worse and worse. Sirena rolled and plunged and for me, helming under sail became harder. Muscles in my arms and shoulders burned as I wrenched the boat back on course when the swell rolled her off it. Two hours of constantly doing that was a challenge. 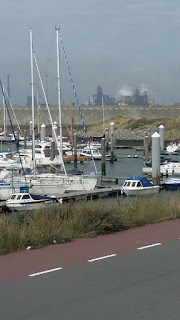 We saw Ijmuiden from many miles away. Actually, we saw the giant pall of steam from the Tata steelworks. 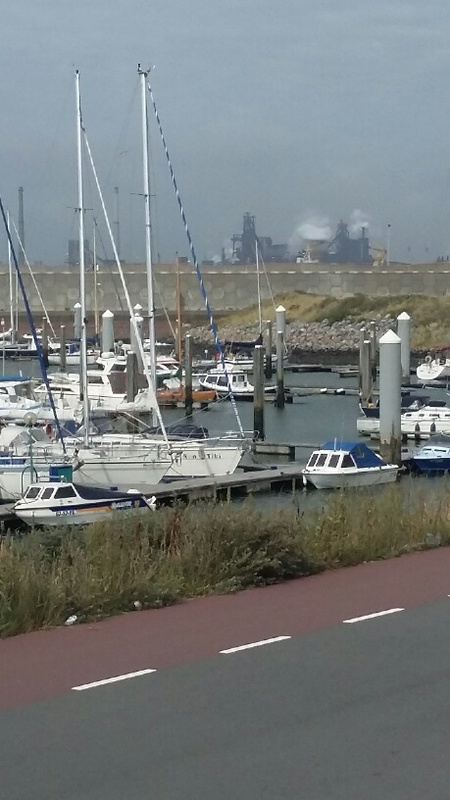 Ijmuiden is not what you'd call scenic. As you can see from the photo of the marina overshadowed by smoking chimneys. The problem now was how to get the main sail down in the big confused seas. One of us had to go to the mast (clipped on with a safety line) to help the sail down and zip up the cover. I volunteered but Nic eventually persuaded me he should go. I turned the boat into the teeth of the wind with engine on and we bucked and plunged wildly as Nic dealt efficiently with the sail. All done, we got back on course heading for the wide harbour entrance. Once inside the walls we realised we could have dropped the sail there in relative peace! We motored into the large Seaport marina, ignoring the wide inviting channel that takes you to the locked canals leading to Amsterdam and the rest of the inland waterways of Netherlands. That's for later this week. For now, we were exhausted and content to have made the 140 mile journey (our longest leg) in one piece.